For this view of Nihonbashi Bridge and the surrounding area, Hiroshige pictured a view from the northeast. By using a bird's eye perspective, he was able to clearly show the people crossing the bridge. The men carrying shallow wooden buckets suspended from shoulder poles are fishmongers who have visited the fish market located at the east end of the bridge, just beyond the picture's lower edge. At the lower right are two men carrying a sake cask emblazoned with the trademark of a famous brewer in Osaka. 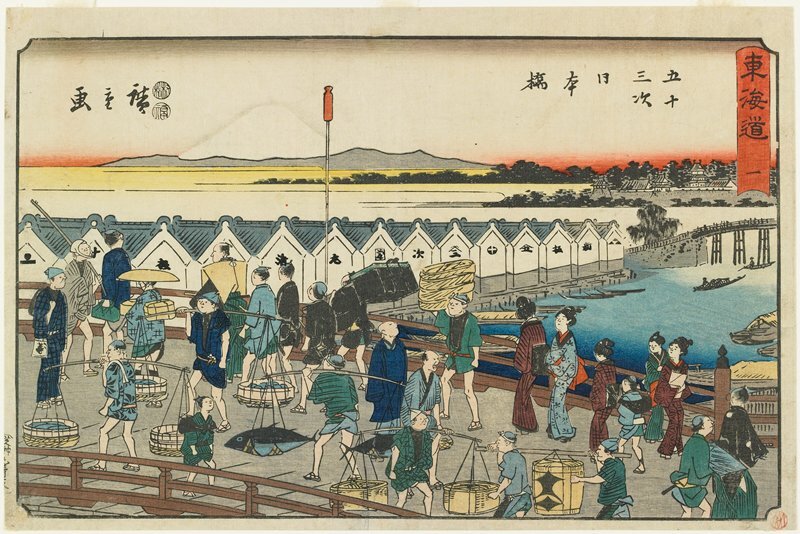 There are also women, shop boys (carrying a small bundle on their back), as well as a group of samurai followed by a porter and a standard-bearer. Depicting twenty-seven people from all walks of life, the print shows the great diversity of the thriving metropolis.